Over the past three decades the application of non-invasive ventilation has emerged as a core therapy in the management of patients with acute and chronic respiratory failure. 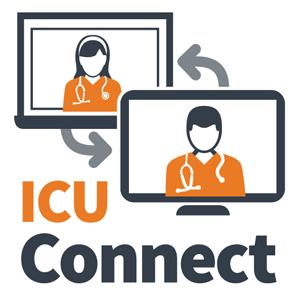 While the use of NIV in acute respiratory failure was initially confined to the critical care setting it is now well accepted that some patients can be effectively managed in alternative settings where appropriate resources, expertise and staffing are available. reduce mortality and morbidity in those with acute on chronic respiratory failure (1, 2). 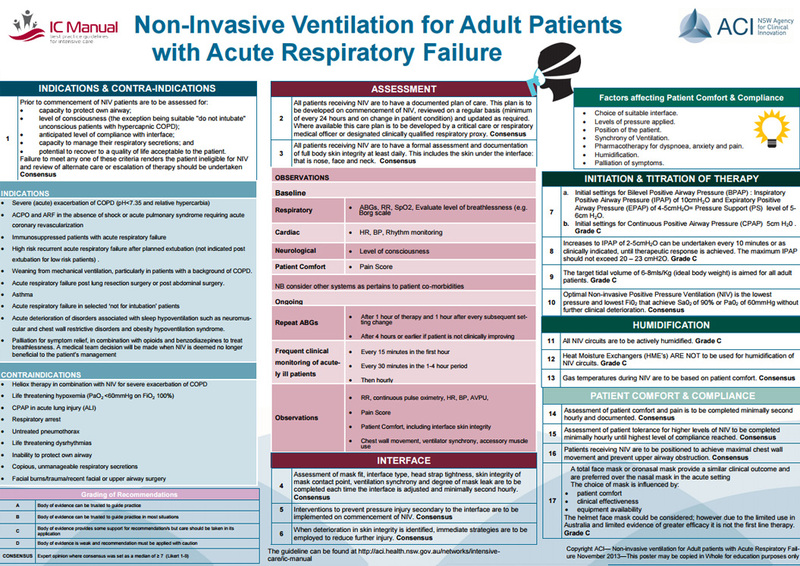 Read the Non-invasive ventilation guidelines for adult patients with acute respiratory failure. 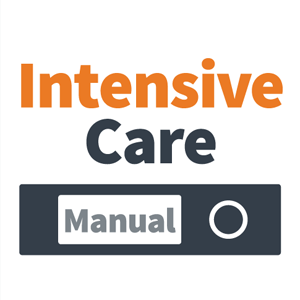 The purpose of this guideline is to provide a consistent level of support and guidance to clinicians in adult critical care areas and specialist respiratory care units about the care required for patients receiving NIV. 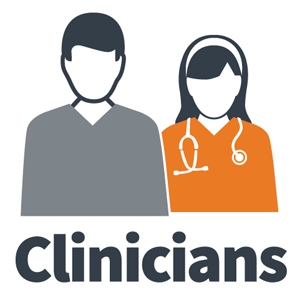 This guideline draws on current best evidence and clinical expertise and describes key aspects of care including: 1) clinical assessment; 2) NIV management; and 3) and patient care. The guideline does not include recommendations regarding other treatments that patients may require including bronchodilators, cortocosteroids or antibiotics. The degree to which an adult patient is compliant with NIV not only relates to his or her presenting physiological condition, it also involves a combination of issues associated with the therapy. Primary among these issues is the care required to ensure patient comfort, and thus, compliance. The development of this guideline is to formulate recommendations about best practice (based on evidence and clinical expertise) for the care to be provided to a person receiving NIV. The recommendations apply to patients receiving NIV in rural, regional or urban setting and in any adult critical care or specialised respiratory unit, irrespective of the level of Medical Officer and/or allied health professional support. The scope of this guideline is for critically ill adult patients who, following medical assessment, require non-invasive positive pressure ventilation as an adjunct to standard medical therapy. This may occur in intensive care, high dependency and dedicated specialist respiratory units with a higher level of clinical support. It should be noted that this guideline was developed using evidence of best practice relating to adult patients only. The concepts and recommendations may be considered when providing NIV to children. 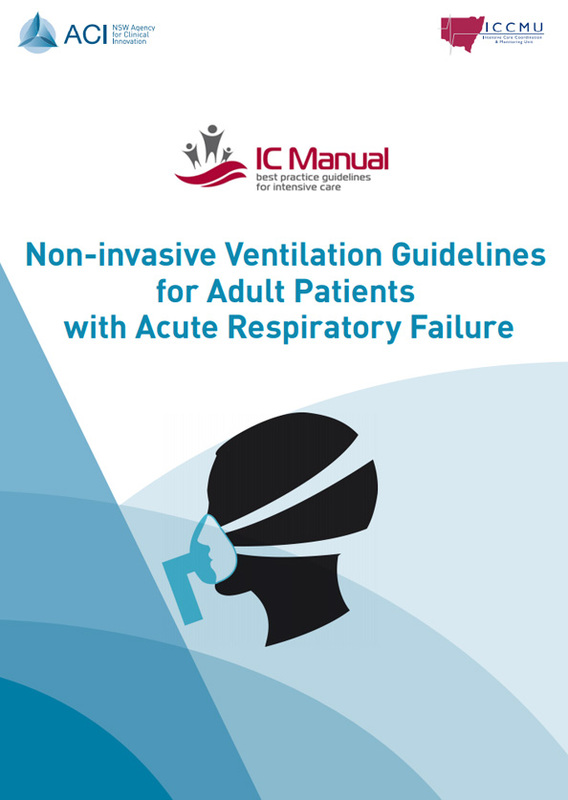 This guideline has been developed for all healthcare professionals who provide care for patients with acute respiratory failure who are treated with NIV including nurses, doctors, physiotherapists and other allied health professionals. A systematic guideline development method (3) was used, based on NHMRC processes and the AGREE tool. A guideline development network (GDN) was formed. This network developed the guideline template that outlined the clinical question and specific areas to be addressed within the guideline. Following this a systematic review was undertaken (for more details see below). The practice review was restricted to a review of local practices from all NSW ICUs. Of the 39 ICUs reviewed, there was a large variance in policies, protocols and practices related to the use of NIV. 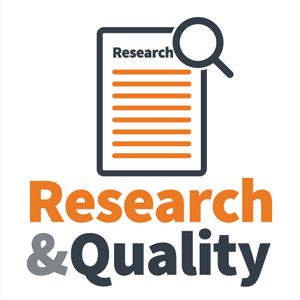 A technical report was developed from the systematic review and this document was used to inform discussions and recommendation development at the consensus meeting (November 27, 2012). Guideline group consensus - two intensive care doctors were recruited. This larger guideline group received the guideline and technical report. Agreement on recommendations was undertaken using an online survey (Survey Monkey) and a 1-9 Likert scale. Consensus was set as a median of ≥ 7 (see Table 9). Organisational consultation was undertaken by distributing the guideline via ACI network consultation. Following each stage the guideline was revised to reflect the feedback received. potential to recover to a quality of life acceptable to the patient. Failure to meet any one of these criteria renders the patient ineligible for NIV and review of alternate care or escalation of therapy should be undertaken (4, 5). All patients receiving NIV are to have a documented plan of care. This plan is to be developed on commencement of NIV, reviewed on a regular basis (at least every 24 hours and with a change in the patient’s condition) and updated as required. Where available, the care plan is to be developed by a critical care or respiratory Medical Officer or designated clinically qualified respiratory proxy. All patients receiving NIV are to have a formal assessment and documentation of full body skin integrity at least daily. This includes the skin under the interface i.e. nose, face and neck. Assessment of mask fit, interface type, head strap tightness, skin integrity of mask contact point, ventilation synchrony and degree of mask leak are to be completed each time the interface is adjusted and at least second hourly (6, 7). Interventions to prevent pressure injury secondary to the interface are to be implemented on commencement of NIV. When deterioration in skin integrity is identified, immediate strategies are to be employed to reduce further injury (6). a) Initial settings for bi-level positive airway pressure (BPAP): inspiratory positive airway pressure (IPAP) of 10cmH2O and expiratory positive airway pressure (EPAP) of 4-5cmH2O= pressure support (PS) level of 5-6cm H2O (6, 8). Increases to IPAP of 2-5cmH2O can be undertaken every 10 minutes or as clinically indicated until therapeutic response is achieved. The maximum IPAP should not exceed 20 – 23 cmH2O (6). The target tidal volume of 6-8mls/kg (ideal body weight) is the target for all adult patients (7). Optimal non-invasive positive pressure ventilation (NIV) is the lowest pressure and lowest Fi02 that achieve Sa02 of 90% or Pa02 of 60mmHg without further clinical deterioration (9). All NIV circuits are to be actively humidified (10). Heat moisture exchangers (HMEs) are not recommended for NIV (10). Gas temperatures during NIV are to be based on patient comfort (10). Assessment of patient comfort and pain is to be completed at least second hourly and documented (11). Assessment of patient tolerance for higher levels of NIV is to be completed at least hourly until highest level of compliance reached (11, 12). Patients receiving NIV are to be positioned to achieve maximal chest wall movement and prevent upper airway obstruction (6). A total face or oronasal mask provide a similar clinical outcome and are preferred over the nasal mask in the acute setting (4). The total face mask could be considered; however due to the limited use in Australia and limited evidence of greater efficacy it is not the first line therapy. A clear plan for the parameters indicating escalation to intubation and ventilation in the event of NIV failure is to be documented on clinical presentation or initiation of therapy (6). If the patient does not clinically improve within four hours of starting NIV the decision to intubate and ventilate is to be made (6). Intubation and ventilation is to be implemented rather than NIV continued for late failure (where late failure is defined as failure after 48 hours of NIV) (6). A clear plan for the parameters indicating the decision not to intubate and ventilate in the event of NIV failure is to be documented on clinical presentation or initiation of therapy. This decision is to be discussed between the patient (or enduring guardian) and treating medical specialist and documented in the clinical records (6). An advanced health directive is to be completed for any future presentations if one has not previously been completed (13). Palliation for symptom relief, in combination with opioids and benzodiazepines, to treat breathlessness is to be documented on clinical presentation or initiation of therapy by medical staff. Such plans are to be implemented by nursing staff in response to assessment of patient comfort as required (6). to be asked if they have a current advanced health directive prior to the implementation of NIV. A significant other may provide evidence of any directives and should be included in this conversation. Patients who do not have a current advanced health directive are to be provided with information relating to advanced care planning as part of an integrated care plan for management of their wishes for end-of-life care, once they are clinically stable (13). A clear plan for the nursing care to be provided while the patient is receiving NIV is to be documented within 24 hours of initiation of therapy. This plan is to include the psychosocial support including (but not limited to) cultural safety, spiritual needs, family needs and financial concerns. Oral hygiene is to be attended every two hours as long as the patient’s tolerance to ceasation of NIV is longer than five minutes. Refer to the Oral Care Clinical Practice Guideline for further information. Eye care is to be attended every two hours. Refer to the Eye Care Clinical Practice Guideline for further information. A full body wash, including facial shave, is to be attended daily or more often as required in response to patient diaphoresis and the patient’s level of tolerance.. Patients are to receive pressure injury prevention management as per the Pressure Injury Prevention Guideline. Patients are to be encouraged to sit out of bed as tolerated. When in bed they are to be positioned in an upright position to facilitate chest wall expansion. The Physical Activity and Movement Guideline provides a graded mobility schedule. 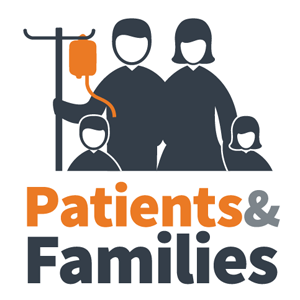 Patients are to be assessed and managed as per this guideline. Pharmacotherapies (i.e. anti-anxiolytics) are to be documented by medical staff on clinical presentation or initiation of therapy and implemented by nursing staff as required in response to patient assessment (6). Referrals to allied health professionals are to be implemented where services are available in the clinical setting to support the patient and his or her significant other/s psychosocial wellbeing. Oral feeding is to be initiated if the patient is able to tolerate small periods off NIV. No oral intake is to be implemented if the patient has a decreased LOC or the patient is in respiratory distress with an increased work of breathing (i.e. R.R > 30/min). Intravenous fluids are to be commenced in these circumstances. Patients receiving NIV are to have daily UECs and CMP blood samples taken for the duration of their NIV therapy to assess fluid and electrolyte status (6). Patients receiving NIV are to have a strict fluid balance and stool chart implemented for the duration of their NIV therapy to assess elimination and fluid status. Dietetics and nutritionist assessments are to be undertaken and documented for the patient receiving NIV 24 hours after initiation of therapy. Clinicians are to undertake a risk assessment to identity the risk of contamination and mucosal or conjunctival splash injuries when caring for a patient being treated with NIV. PPE (including goggles/face shield/gloves and gown/apron) as per NSW 2007 Infection Prevention Control Policy should be worn according to the risk assessment (14, 15). PD2007_036 Australian Guidelines for Prevention & Control of Infection in Healthcare. Clinicians must adhere to the Five Moments of Hand Hygiene (16). To reduce the risk of microbial transmission, equipment utilised for each patient must be cleaned as per the NSW Infection Control Policy and ASA Standard 4187 prior to and following use (14, 17). Items labeled single patient use are intended to be used in the care of one patient only and are to be discarded when the patient no longer requires the item (14). Reuse of an NIV circuit/face mask may be possible only if the items are marked as reuse and cleaning instructions are supplied; the manufacturer’s recommendations are to be followed. The NSW Infection Control Policy (PD2007_036) states that the circuit and face mask are classified as a semi-critical item and require cleaning and disinfection before reuse (14). Any health facility that provides NIV should have a policy/procedure stating patient selection criteria and management plan/s for patients recovery, NIV including initial settings and escalation strategies (18). The frequency of documentation for NIV is to be at least hourly in the acute phase and then may be reduced to 2-4 hourly once the patient is stable or is in a specialised respiratory unit. Patients receiving NIV must be located in a ward area where there are appropriate numbers of competent staff able to provide monitoring and titration of therapy consistent with all aspects of patient care required. Organisations providing NIV are to have formal education processes relating to NIV and a competency assessment package for new graduates and staff working in these areas. The evidence review for these recommendations was current to December 2012. Clinicians are advised to check the literature as research may have been published that change these recommendations. Ram FS, Picot J, Lightowler J, Wedzicha JA. Non-invasive positive pressure ventilation for treatment of respiratory failure due to exacerbations of chronic obstructive pulmonary disease. Cochrane Database Syst Rev. 2004;3. McCurdy B. Noninvasive Positive Pressure Ventilation for Acute Respiratory Failure Patients With Chronic Obstructive Pulmonary Disease (COPD): An Evidence-Based Analysis. Ontario Health Technology Assessment Series. 2012;12(8):1. Rolls K, Elliott D. Using consensus methods to develop clinical practice guidelines for intensive care: the Intensive Care Collaborative project. Australian Critical Care. 2008;21(4):200-15. Keenan SP, Sinuff T, Burns KE, Muscedere J, Kutsogiannis J, Mehta S, et al. Clinical practice guidelines for the use of noninvasive positive-pressure ventilation and noninvasive continuous positive airway pressure in the acute care setting. Cmaj. 2011;183(3):14. Hill NS. Where should noninvasive ventilation be delivered? Respir Care. 2009;54(1):62-70. Roberts CM, Brown JL, Reinhardt AK, Kaul S, Scales K, Mikelsons C, et al. Non-invasive ventilation in chronic obstructive pulmonary disease: management of acute type 2 respiratory failure. Clin Med. 2008;8(5):517-21. Vargas F, Thille A, Lyazidi A, Campo FR, Brochard L. Helmet with specific settings versus facemask for noninvasive ventilation. Crit Care Med. 2009;37(6):1921-8. Plant P, Owen J, Elliott M. Early use of non-invasive ventilation for acute exacerbations of chronic obstructive pulmonary disease on general respiratory wards: a multicentre randomised controlled trial. The Lancet. 2000;355(9219):1931-5. Cross AM, Cameron P, Kierce M, Ragg M, Kelly AM. Non-invasive ventilation in acute respiratory failure: a randomised comparison of continuous positive airway pressure and bi-level positive airway pressure. Emerg Med J. 2003;20(6):531-4. Restrepo RD, Walsh BK. Humidification during invasive and noninvasive mechanical ventilation: 2012. Respir Care. 2012;57(5):782-8. Holanda MA, Reis RC, Winkeler GF, Fortaleza SC, Lima JW, Pereira ED. Influence of total face, facial and nasal masks on short-term adverse effects during noninvasive ventilation. J Bras Pneumol. 2009;35(2):164-73. Arroliga AC. Noninvasive positive pressure ventilation in acute respiratory failure: does it improve outcomes? Cleveland Clinic journal of medicine. 2001;68(8):677-80. Officer OotCH. Advanced Care Directives NSW. Sydney: Ministry of Health; 2005. Clinical Safety QaG. Infection Control Policy. In: Health Do, editor. Sydney: NSW Health 2007. NHMRC. Australian Guidelines for the Prevention and Control of Infection in Healthcare. Canberra: Commonwealth of Australia; 2010. Clinical Safety QaG. Hand Hygiene Policy. In: Health Do, editor. Sydney: NSW Department of Health; 2010. Association AS. Cleaning, disinfection and sterilizing resusable medical and surgical instruments and equipment, and maintenance of associated environments in health care facilities. Australian Standards Association; 2003. McCurdy B. Noninvasive Positive Pressure Ventilation for Acute Respiratory Failure Patients With Chronic Obstructive Pulmonary Disease (COPD): An Evidence-Based Analysis. Ontario Health Technology Assessment Series. Ontario2012. p. 1-108.